Spinning Pearls: Take Two! Margaret West talks about "Two Faces, One Life". Take Two! Margaret West talks about "Two Faces, One Life". Here's the second of my short'n'snappy interviews. Margaret West is the author of a "coffee break short" named "Two Faces, One Life", published by Eternal Press. Q.1. “Two Faces, One Life” is an interesting title. How does this relate to your story? A. The story really revolves around Sarah, a young girl who was caught in a fire. One side of her face and body, is very badly burnt in a fire, while the to her stays perfect. A cruel irony of what she has lost. Its an inspirational story because the 'vain' Sarah believes her life is now over and wants to die. But what she comes to realise, after a chance meeting in a park with ted, is that true beauty shines from within. The 'new' Sarah is about to embark on a whole new journey. Even though she has two very different sides to her face. She only has one life and she needs to live it. Q.2. “Two Faces, One Life” is a “coffee-break” short. Did you set out to write a short tale, or did the length just seem right? A. The length just seemed right. I didn't want it to go on endlessly about the trials of Ted's disability, or Sarah's disfigurement. I just wanted to get across that having a disability doesn't mean your life is over. When it was published however, I received quite a few comments from readers wanting to see what happened to Sarah and Ted. So maybe there will be a short sequel, who knows lol. 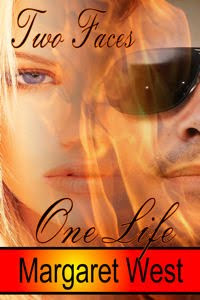 Hi Margaret, "Two Faces, One Life" sounds like a beautiful story! I was definately one of those readers who wanted the story to go on! I really enjoyed this short but sweet novel by Margaret West - I would love to see a sequel..! Oh, wow, Margaret. I read the post. How very inspirational this sounds. This is a must read for me. Too many people still see only the infirmity when looking at a person, and not the real person. Thanks for your comments, ladies. It's great you all took the time to drop in. What an intriguing story, Margaret. It's a true testament to your writing when readers want the story to go on. Sounds like a wonderful tale. I love the cover art! Very evocative. Thanks for the comments, kind readers. Be sure to check back every day or so for a new Take Two mini interview. I've had a great response to my request for subjects.